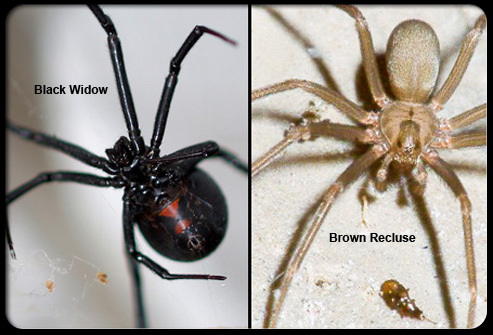 Home/General Pest Control, Our Blog, Prevention, Spiders, Treatment/Brown Recluse or Black Widow, Which Spider Should You Fear More? Black Widows favorite food source is the fly, so watch out when using the toilets in restrooms and out houses, also they can be found under well /septic tank covers, under water meter covers, near entrances around crawl space doors, garage doors, under wood piles, under rocks, all these are just a few of the many areas you can find them nesting. Brown Recluse bites mostly occur when people put on a piece of clothing that’s been sitting in the closet /storage too long. So always look through your clothing for the spider and or webbing before putting it on, check the inseams, pockets or even inside your shoes. Other areas they like to live is in basements, attics, sewers, closets, under rocks/woodpiles. The bite of the Black Widow can affect the nervous system. It is usually very painful, and not everybody reacts the same to it. It can be minimal as swelling around the bite, to severe neurological damage. I personally was bitten by a large female, in the hand. The pain from the initial bite was intense at first, I had some swelling around the bite, but after a couple of days some itching occurred and that was it. Symptoms range from weakness, tremor, abdominal pain, muscle cramps, nausea, vomiting, dizziness ,chest pain, and respiratory difficulties. The bite of a Brown Recluse effects cells and tissues. The venom is more potent than a rattlesnake, but since the spider injects far less venom it does less damage. The bite may go unnoticed at first unlike the black widow. Symptoms occur usually within hours after the bite, severe pain, itching, fever, and muscle pain. The Black Widow gets its name do to the fact the female spider kills the male after mating, but other species of spiders do the same. There are 5 species of black widows in the U.S. the southern and northern widow are the most common. The southern can be identified by its shiny, black, globular abdomen with a distinctive red hourglass shape on its underside. The northern widow can be identified by a row of red spots down the middle of the upper surface of the abdomen, and two crosswise bars on the undersurface. Similar species that look like them are the false widow (harmless spider). The Brown Recluse gets its name because they tend to be in very reclusive areas. Several species of spiders resemble the recluse, most commonly the wolf spider, and desert recluse. Brown recluse can be identified by a violin pattern on the upper cephalothorax (the part where the legs attach), are yellow in color, and have six eyes. They only tend to bite if they feel threatened. Unlike the black widow which uses its web to catch prey, the recluse searches for prey at night and rests in the day in its small web. From Black Widow bite usually after 2 days you will notice redness and swelling, after 8 days the swelling will normally go down the bite will open and the infection will be gone. From Brown Recluse bite usually days to weeks the bite site becomes firm and will heal over with minimal scaring. In some cases the local reaction will be more severe with redness, blue discoloration, blistering, tissue death and scarring. Pain medications, skin grafting, intravenous antibiotics, are then needed. You should seek medical attention immediately when bitten by these 2 spiders at a HOSPITAL who are equipped to treat using required narcotic pain relievers, and anti venom. Bring the spider with you. Both of these spider bites are more serious to children and the elderly. So to come to a conclusion it’s obvious both spider bites can be very dangerous. Brown recluse usually doesn’t kill a person the worst that can occur is amputation of a limb, removing and skin grafting the damaged tissue. But the Black Widow can have a more lethal bite since it not only effects tissue but the neurological system, which can lead to death.